Criticized By Peers, White House Counterterrorism Adviser Returns Fire Sebastian Gorka responded to critical posts on Twitter by threatening to involve White House lawyers. He is fighting questions about his credentials and his views on Islam. President Trump's deputy assistant Sebastian Gorka participates in a discussion during the Conservative Political Action Conference on Friday. Gorka has been the subject of criticism by others in the counterterrorism field. President Trump's counterterrorism adviser is under fire from his peers — and Sebastian Gorka is hitting back. Just ask Michael Smith. He's a counterterrorism expert in Charleston, S.C., who specializes in online recruiting efforts and who has advised members of Congress on terrorism-related issues. Smith says that at about 7 p.m. Tuesday, he received a call on his smartphone from a private number in Falls Church, Va. It was Gorka — not calling from a government line at his office at the White House. "The statements made from the very beginning led me to believe that it was a prank call," Smith tells NPR. "Because he's calling me from a cellphone suggesting that he wants to talk about official business — specifically, elevating awareness of my tweets about him to White House legal counsel." Smith has been a prominent critic of Gorka, questioning the 46-year-old British immigrant's qualifications to be Trump's new counterterrorism czar. "I frankly was stunned that the administration would hire him to work in the White House on such critical issues as counterterrorism," says Smith, a Republican who voted for Trump. "This could blow up in our faces, to have basically an amateur working on such important policies and working with people like [White House chief strategist] Steve Bannon." Much of Smith's criticism of Gorka has appeared on his Twitter account under the hashtag #FakeTerrorismExpert. Gorka began their phone conversation by threatening to have a White House legal team review Smith's online jabs, Smith says. "I believe it speaks to an absence of professionalism," Smith says. "I mean, to call somebody and posture intent to entangle that person in a legal battle with the White House — that's a call that should be made on an official White House line so there's a full recording of it for the public record." Gorka: Why, why is there such vitriol pumping out of you constantly every day now? It's so strange. I look at your Twitter feed, you know, once or twice a day and again, it's half a dozen tweets about me and I've never met you. Smith: ... and begun the conversation very confrontationally by accusing me of animus toward you. Of which I'm attempting to explain, there is no animus towards you: I believe that you are a charlatan. Gorka: Before I do anything and show these materials to legal counsel, tell me why you're doing it. Smith says Gorka's initial harsh tone softened during the call. "I think it occurred to him that he may be approaching things in such an unprofessional manner that I could perhaps bring that to light in such a way as to harm his career working in government," Smith says. "He probably recognized that his conduct was so unbecoming." Gorka did not respond to NPR's repeated requests for comment on this story. He did appear on Morning Edition earlier this month to talk about the counterterrorism raid that Trump ordered in Yemen and the administration's positions about Israeli settlements. As for his conversation with Smith, Gorka invited him during the call to come to the White House to discuss the matter "face to face, man to man." They agreed to meet there on March 8. That invitation was rescinded the next day. "Given your statements for the latest attack piece and continued disparaging Tweets against not only myself but the administration and president," Gorka wrote in an email to Smith, "consider your invitation to meet withdrawn." 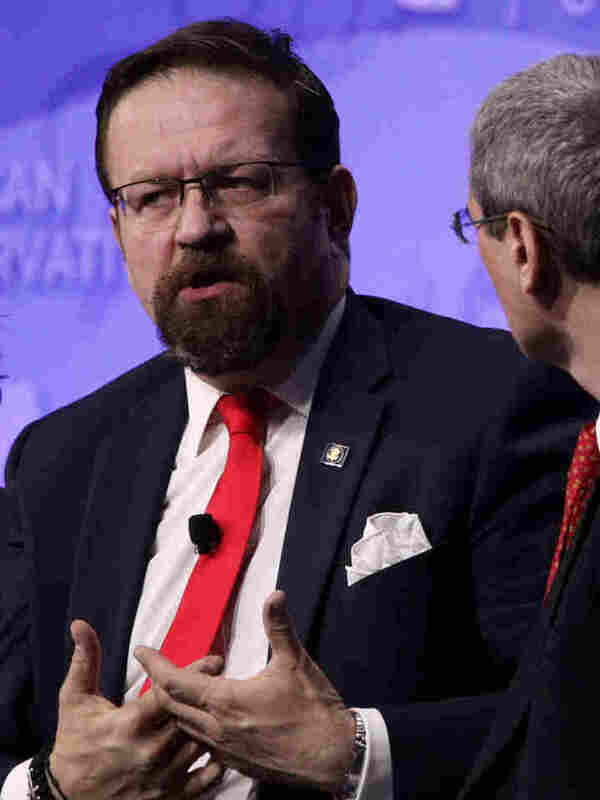 Despite having authored the best-selling 2016 book Defeating Jihad: The Winnable War, Gorka was not well-known in Washington before his arrival at the Trump White House. "This is somebody who has been kind of excluded from a lot of mainstream conversations for a long time," says James Carafano, a military expert at the Heritage Foundation and a member of the Trump transition team. "And if there's one thing Seb is well-practiced at, it's about not being ignored." In a December interview with Fox News, Gorka declared: "The era of the pajama boy is over January 20th — and the alpha males are back." Gorka seemed to illustrate that point three days after Trump won the presidency, at a gathering in Palm Beach, Fla.
"I'm gonna start with something a tad naughty," he told a giddy crowd of Trump supporters. "We are happy. But I am going to show a picture I'm not meant to show usually." A grisly photo was then projected onto a large screen of the body of an insurgent lying face down, with an AK-47 at its side. "We can win now," Gorka roared before the cheering crowd. "We can win!" "Gorka is a showman," says Paul Pillar, a former chief of counterterrorist analysis at the CIA who is now a fellow at Georgetown University. "Gorka is not taken seriously as an analyst of terrorism or international affairs in the serious academic community." Still, Trump's top counterterrorism adviser has gotten a lot of attention. That's due in good measure to Gorka's fierce public defense of the president's executive order temporarily barring the entry of refugees and the people of seven predominantly Muslim nations. "The border is our front door," Gorka told an approving crowd at this year's Conservative Political Action Conference outside Washington, D.C. "Surely we should have a control as to who enters our house. This is the house of America, and the idea that we don't control it is crazy!" Such views alarm Gorka's critics. "It is dangerous and counterproductive to allege, as Gorka does, that the struggle against terrorism and political violence is basically a struggle against Islam," says Georgetown's Pillar. "Unfortunately, the doctrine that Gorka articulates is reflected in much of what President Trump and, earlier, candidate Trump have been saying." At another recent gathering, Gorka described a global jihadi war that extends to every American home. "The front line in this war," he told defense contractors and special operations personnel, "is when you step out of your house in the morning. That's the front line."